Tiffy & Toffee Baby Liquid Cleanser is a baby feeding bottle and accessories liquid cleanser with natural origin biodegradable surfactants and plant extracts which makes it non-toxic and anti-bacterial. Its eco-friendly and non-artificial color goes gentle on your baby's skin and avoids fungal infection. As it has 100% food grade ingredients, it is safe to wash fruits and vegetables as well as baby's accessories without any need to keep separate cleanser. This super cleanser is best in bacteria-removing and contains no harmful remnants, in order to give your baby a safe and protective experience. Additional Information: Tiffy & Toffee is a leading childcare brand which strongly believes in offering products that are safe, comfortable and futuristic. Backed by strong research, design, and innovation, Tiffy & Toffee has always delivered luxury and convenience for babies and parents. 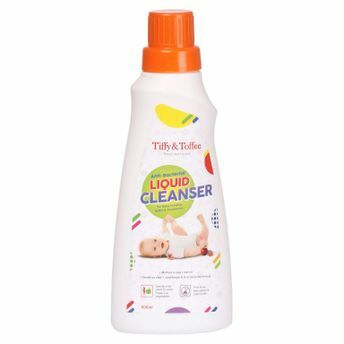 Alternatively, you can also find many more products from the Tiffy & Toffee Baby Liquid Cleanser range.